You can manage Lync Online by clicking the Manage link under the Lync Online section of the Office 365 management screen. When on the Lync Online management screen, you can configure domain federation, public Instant Messaging (IM) settings, and user information. Domain federation lets you control the domains that your organization can connect with using Lync Online. You can allow preferred domains or domains outside of your corporate network so that partners can connect with employees and block other domains to avoid unwanted distractions. 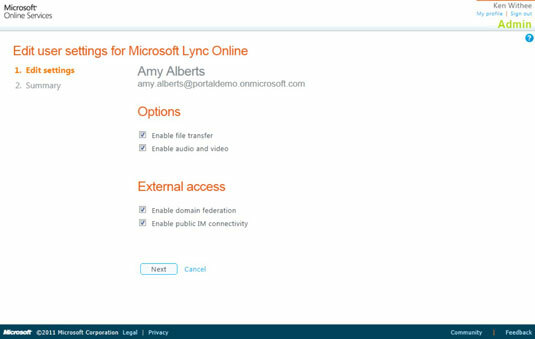 With Lync Online, you can enable or disable public instant messaging. This functionality lets you control whether you let users chat with the general public or whether you want to restrict messaging to only users on the corporate network or preferred domains. If you choose to allow communication with the general public, your users can add contacts from the Windows Live, AOL, Yahoo, and Google chat programs. The user information screen of Lync Online allows you to configure options and external access for individual users. In particular, you can enable or disable file transfers, audio and video, domain federation, and public Instant Messaging (IM) connectivity.